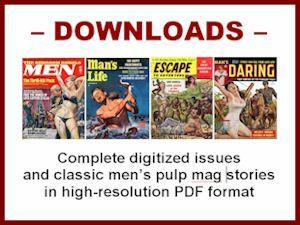 Like many fans of the men’s pulp adventure magazines that were published in the 1950s, 1960s and 1970s, I’m also a fan of the classic action, adventure and science fiction movies produced during those same decades. That’s why I’m an avid reader of CINEMA RETRO, the premier magazine about movies of the ‘60s and ‘70s. I’ve been a subscriber to CINEMA RETRO since it was launched in 2005 and look forward to every lushly-illustrated, trivia-filled issue. Pfeiffer is Editor-in-Chief of CINEMA RETRO. He’s also the author or co-author of a long list of film-related books, including THE COMPLETE IDIOT’S GUIDE TO CLASSIC MOVIES (2006), THE CLINT EASTWOOD SCRAPBOOK: THE ULTIMATE FAN'S GUIDE (1998), THE JOHN WAYNE SCRAPBOOK (2001), and THE ESSENTIAL BOND: THE AUTHORIZED GUIDE TO THE WORLD OF 007 (2002), written with his fellow James Bond expert and CINEMA RETRO co-founder Dave Worrall. But I’m pretty sure Lee actually meant that last part in an appreciative way, too, since there are many obvious overlaps in his tastes and mine — and between men’s pulp magazines and the types of movies featured in CINEMA RETRO. Consider, for example, the latest issue: Vol. 8, Issue 22. The cover has an eye-popping publicity photo of actress Sybil Danning dressed (barely) in the costume she wore in the science fiction flick BATTLE BEYOND THE STARS (1980). The costume she’s wearing in the CINEMA RETRO cover pic reminds me of some of the costumes painted onto the exotic, Amazon-like women that were popular in men’s pulp mag artwork. 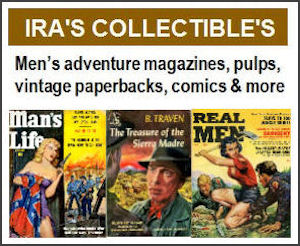 In fact, many of Sybil’s fan-favorite films are pulpy romps involving scantily-clad, weapon-toting women, or women in prison, or evil Nazis — the kind of stuff that vintage men’s adventure magazines are full of. The movie posters shown on page 5 of the new issue of CINEMA RETRO are a good example of some other connections between the men’s adventure periodicals and films produced in the ‘60s and ‘70s. The paintings used in both posters were done by Frank McCarthy, an artist who created many cover paintings and interior illustrations for men’s adventure mags. Clearly, that poster art — for the 1968 film known as DARK OF THE SUN in the US and THE MERCENARIES in the UK — looks a lot like the action/adventure cover and interior paintings used by men’s adventure magazines in the ‘60s. So does another Frank McCarthy poster featured further back in Issue 22 of CINEMA RETRO, in a story about the 1969 Cinerama epic KRAKATOA, EAST OF JAVA. 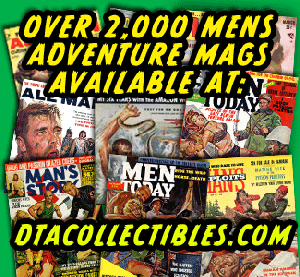 McCarthy started doing artwork for men’s adventure mags when the genre first developed in the early 1950s and continued on until the late 1960s. 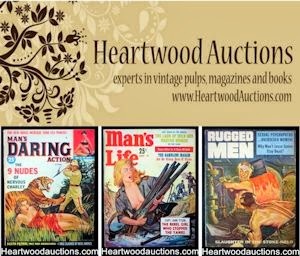 He primarily worked for several of the top tier men’s adventure mags, most notably ADVENTURE, ARGOSY and CAVALIER. Like some other famous men’s adventure artists, such as Mort Kunstler and Gil Cohen, McCarthy began shifting into the generally more lucrative realm of paperback covers and movie posters in the late 1960s. By the time the men’s adventure genre was defunct in the mid-1970s, he was one of the top movie poster artists in the world. The list of films McCarthy did poster art for includes many of my own favorites from my teenage years, such as: TARAS BULBA (1962), THE GREAT ESCAPE (1963), SANDS OF THE KALAHARI (1965), VON RYAN’S EXPRESS (1965), DUEL AT DIABLO (1965), KHARTOUM (1965), THE BLUE MAX (1965), THE DIRTY DOZEN (1967), DANGER: DIABOLIK (1968), WHERE EAGLES DARE (1968) and THE VALLEY OF GWANGI (1970). You can see a longer list on the site Shoot 'Em up Bang Bang: the Movie Art of Frank McCarthy. It also has a good bio of McCarthy and a list of his illustration work for paperbacks and magazines. In the final phase of his career, McCarthy became equally or even better known for his historically-authentic Western paintings. They continue to sell for hefty prices in fine art galleries and online auctions and grace the walls of a number of history-oriented museums. The two books about McCarthy’s work that I’m aware of focus on his Western art phase: THE WESTERN PAINTINGS OF FRANK C. MCCARTHY (1976) and THE ART OF FRANK C. MCCARTHY (1992). Speaking of Westerns, Issue 22 of CINEMA RETRO also includes a fascinating article by pop culture historian Christopher Frayling about the classic, all-star Cinerama film HOW THE WEST WAS WON (1962). The poster art for that epic oater was done by Reynold Brown (1917-1991). Like Frank McCarthy, Brown is one of the great American movie poster artists. Brown’s heyday as a poster artist began in the early 1950s. The amazing list of films he created posters for also include many of my personal favorites, such as: CREATURE FROM THE BLACK LAGOON (1954), THE INCREDIBLE SHRINKING MAN (1957), THIS ISLAND EARTH (1955), I WAS A TEENAGE WEREWOLF (1957), ATTACK OF THE 50 FOOT WOMAN (1958), CAT ON A HOT TIN ROOF (1958), BEN-HUR (1959), SPARTACUS (1960), THE ALAMO (1960), THE TIME MACHINE (1960) and MUTINY ON THE BOUNTY (1962). There’s a nice sampler of Brown’s poster and magazine artwork on the American Art Archives site, which is maintained by my fellow vintage illustration aficionado, Thomas Clement. 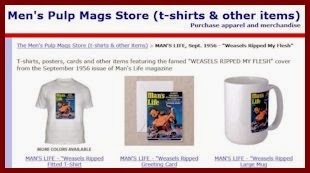 For a more in-depth look at Brown’s life and art, including a chronological gallery showing most of the 250 to 275 movie posters he created, I encourage you to explore the official Reynold Brown site maintained by his family. I also highly recommend the book REYNOLD BROWN: A LIFE IN PICTURES (2009) by Dan Zimmer publisher of another of my favorite modern periodicals, ILLUSTRATION magazine. If you enjoy this blog, you really should get yourself subscriptions to both CINEMA RETRO and ILLUSTRATION. They are two of the best retro pop culture magazines ever published.